What a glorious first birthday party. 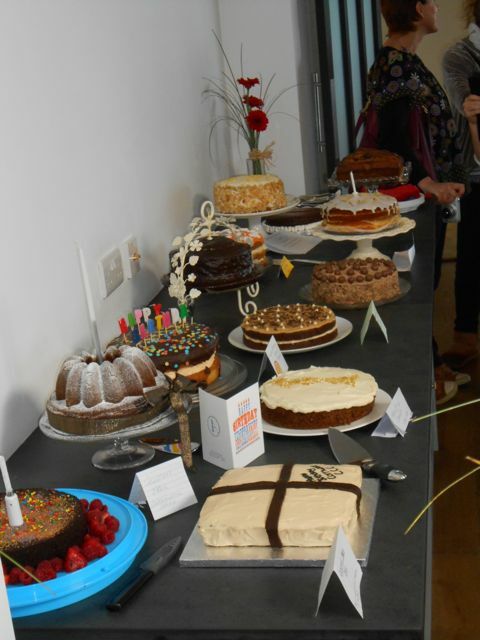 A bunch of Cornish cake fans gathered last Friday to celebrate the first birthday of Cornwall’s Clandestine Cake Club. Ellie Michell, our generous founder and mistress of ceremonies, has been coming up with interesting themes and locating fabulous venues over the last twelve months. You can see her write up here. As this was a Friday, I was not at work and thus able to attend – making this my fourth CCC. I was particularly pleased to catch up with this month’s We Should Cocoa host, the HungryHinny. We gathered on a bright and sunny, if showery, day at the Watergate Bay Hotel near Newquay. The function room has been newly built and enjoys fabulous sea views over the bay. CT, who somehow blagged his way into this event and was the only man present, attempted to eat his body weight in cake. I’m pleased to say he failed in this venture, but I followed his lead and enjoyed more cake than was probably good for me, not sadly, that I managed to try all of them. Driven by guilt we decided to make our way up onto the cliffs and walk off some of our excesses. Somehow we managed to dodge the showers and enjoyed an invigorating hike along Bedruthan Steps. Wow! One year old. Well done you lot! And what an incredible array of cake. It makes one feel jealous and a little ill at the same time!! These cakes are so beautiful!! Fabulous cake selection! Which ones did you taste? Mmmm those cakes look amazing! What a beautiful display of cakes, could you get a slice of each cake????? I like the photos of Cornwall. What a talented bunch you are. The cakes look stunning! Many many many lovely cakes as was to be expected. Wow-I get a little behind catching up on my blog reading and then find you have all been baking these wonderful cakes-I’m almost drooling!! What a nice display of cakes! They are all beautifully made. Seeing the pictures of all the cakes makes me feel full again – I’m actually a little ashamed by how many I managed to try, but they were very thin slivers… Lovely to see you and CT, hopefully catch up at another CCC again soon! Fantastic. I can just see your cake poking out on the table there! Good job you had some amazing views to walk off some of the cake, I wouldn’t have known where to stop. WoW! What a great selection of birthday cakes. Tell me, how do you all manage to try a bit of each without exploding … I’m afraid I wouldn’t be able to stop at just a spoonful of each! Wow, what a fantastic looking collection of cakes for a party! I bet you all felt spoilt and happy to have so much choice!